Breezes heavy with the scent of blossoms, trees stretching to azure skies and fluffy white clouds dotting the horizon are just a small part of nature’s rejuvenating magic. That’s why people are drawn to the outdoors. And when you have a gorgeous, well-appointed backyard, it becomes a safe haven where you know you’ll always be able to relax and enjoy yourself. Read on for some tips from Eldorado Stone, a manufacturer of hand-painted stone veneer, on how to create your own patch of outdoor paradise. 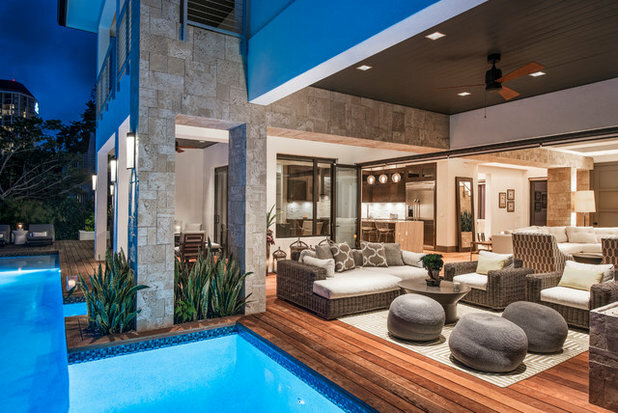 Design your outdoor living spaces around your favorite pastimes, whether that’s snuggling up for a movie night with the kids or enjoying a glass of wine by the fire. Let your imagination roam free during the brainstorming phases and think about what you love to do most. Many traditionally indoor activities can work just as well outside, where you can soak in the sunshine. If you’re an avid chef, for instance, opt for a kitted-out kitchen like the one in this covered porch. A large countertop and peninsula offer plenty of room for prepping and outdoor dining. Two undercounter refrigerators keep grilling ingredients fresh and close at hand, and a sink makes washing veggies and hands easy. There’s even a tap for a favorite beer or cider. A coffered wood ceiling, gray stacked-stone veneer — a durable, low-maintenance material — and greenery provide a warm, organic feel. There’s something so nice about flopping down on a sofa in your living room or sitting down to dinner in your dining room. To enjoy this comforting sense of order in your backyard, create specific areas that meet your needs, such as a living room, dining room or kitchen. This trick will also bring elevated polish to your outdoor spaces. Delineate each “room” using outdoor rugs, different types of paving or a cobblestone or planting border. Then add pieces typically found indoors, such as plush furnishings, chandeliers and TVs, to enjoy the comforts and luxuries you’re used to. A chevron-print rug, a dining set, a cushy sofa and chairs, end tables and a coffee table transform the courtyard seen here into an outdoor living and dining room. The mirror, coffee table vignette, mantel clock and brick-inspired veneer fireplace add to the inviting effect. Take cues from your interiors to create a beautiful, easy flow between your indoor and outdoor spaces. Carry colors, textures, patterns and materials throughout both. Though subtle, a cohesive design aesthetic across borders provides a sophisticated, high-design feel. The living area of the home seen here spills out onto the patio, making it hard to see where the interior stops and the backyard begins. This blurring of spaces, aided by large glass-door systems, creates a dramatic statement and makes both areas seem larger. A consistent palette of soft browns, creams and grays in solid and geometric patterns strengthens the link. 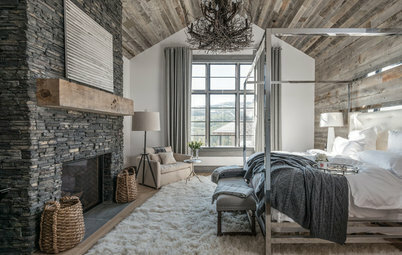 The warm wood flooring, pale wall color and textural stone veneer accents used throughout bring further harmony. 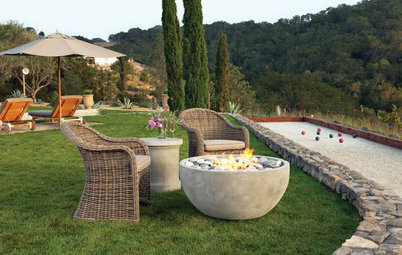 Backyards aren’t just for summers, so build outdoor living spaces you can enjoy all year round. Add plenty of lights for when the days get shorter in the fall and winter — and to stay out longer in the spring and summer. Keep warm with radiant heating, fireplaces and roofed structures such as pergolas and covered porches on cooler nights. 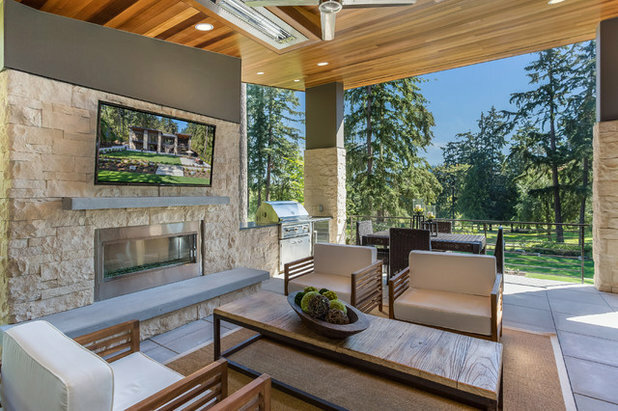 The covered porch seen here features a ceiling-mounted heater and a modern fireplace, pleasingly juxtaposed with a rough stone veneer. A ceiling fan helps combat flies and provides a breeze in the warmer months, and it pushes the heat down toward the seating area when it’s cold. You can also add pull-down screens to the sides of a covered porch to keep bad weather at bay. If you’re feeling fancy, invest in retractable motorized ones. Also think about the view from your outdoor living space and choose plants that have winter interest. 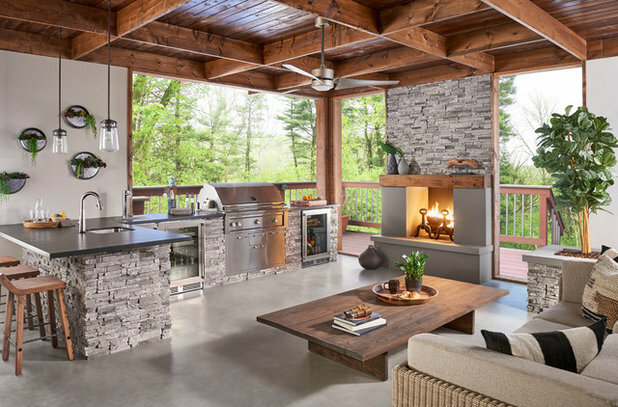 Whether your outdoor style is inspired by the coast, the mountains, the desert or something in between, use these four tips to create a space you never want to leave. I love everyone of these rooms! 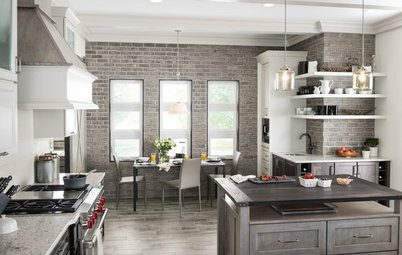 Great job HOUZZ, Keep them coming!